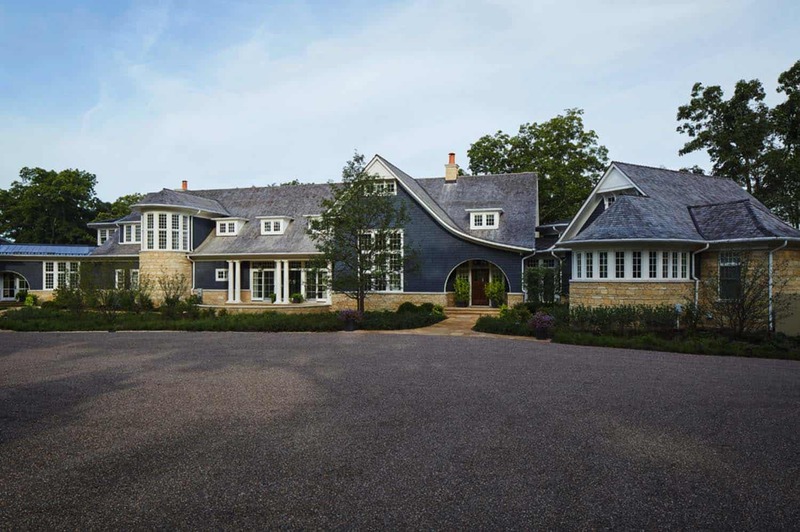 This rambling shingle style home was designed by Morgante Wilson Architects, located in Barrington, a suburban village in Lake County, Illinois. 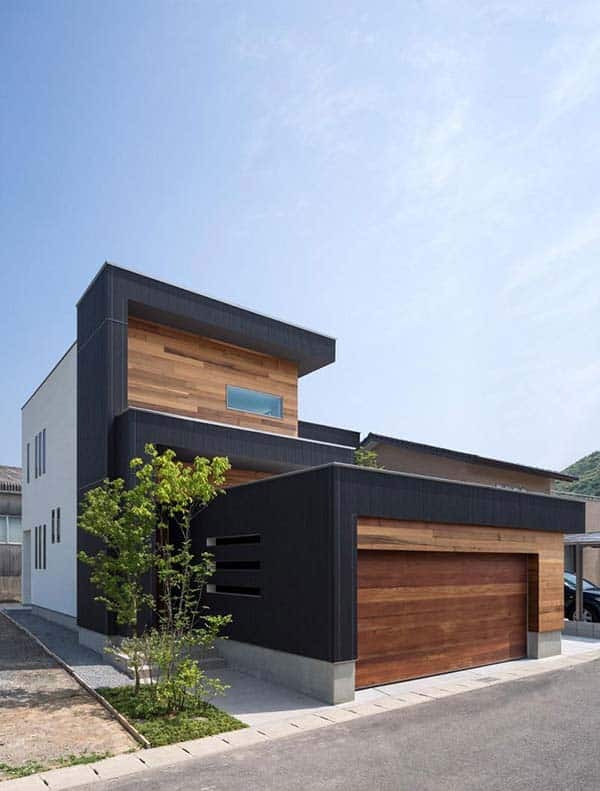 The homeowners requested a large kid friendly family home suitable for entertaining. 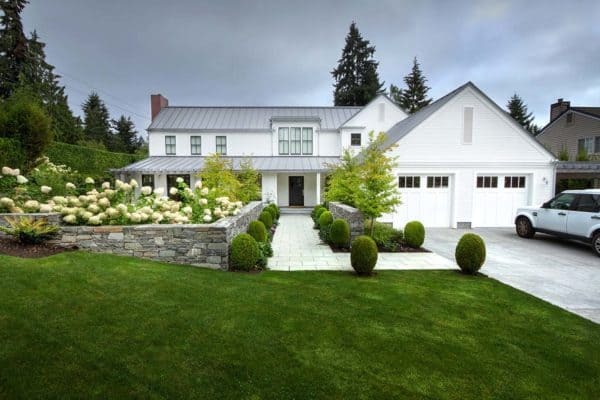 The architects thoughtfully designed this transitional style residence with privacy and functionality and timeless details in-mind. For the interior living spaces, the architects focused on the natural beauty of the site, creating an understated elegance. 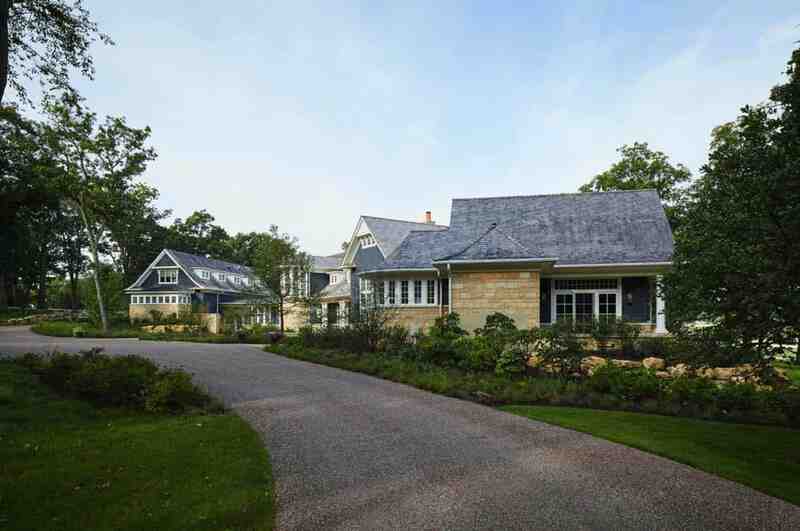 What We Love: This shingle style home boasts a gorgeous exterior facade that is timeless and inviting. 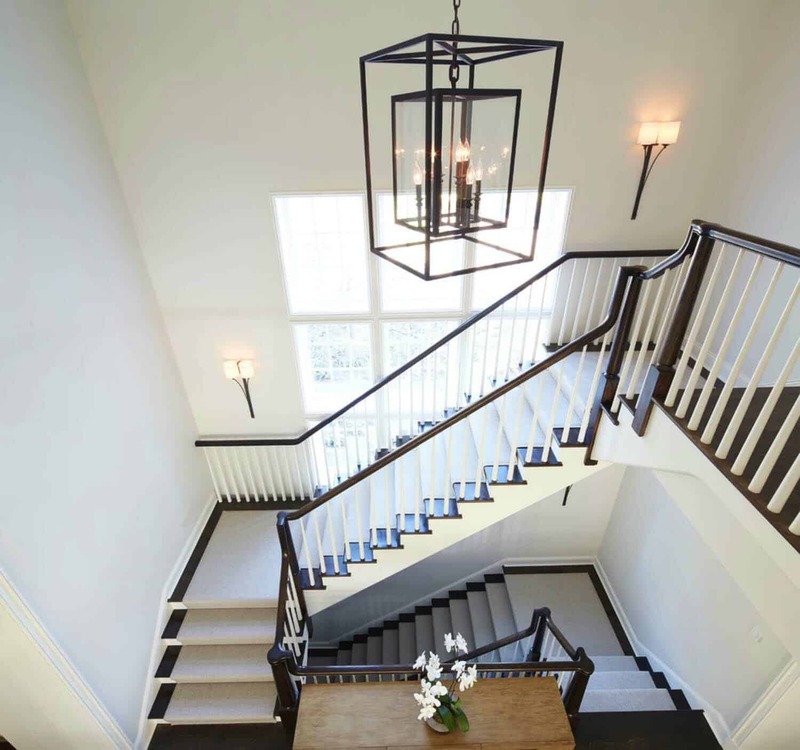 The interior living spaces are equally exquisite, airy and spacious and full of eye-catching details. 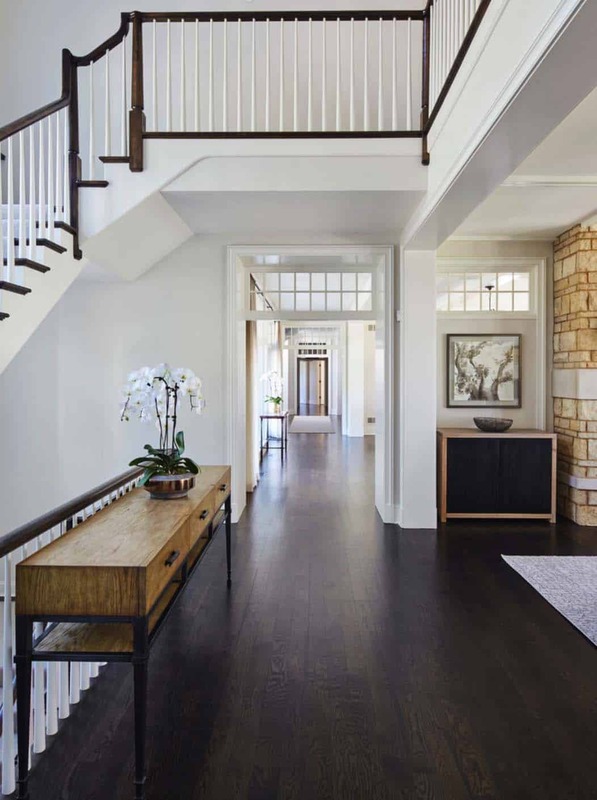 Stylish furnishings, accessories and finishes adds to the overall beautiful aesthetic of this home. 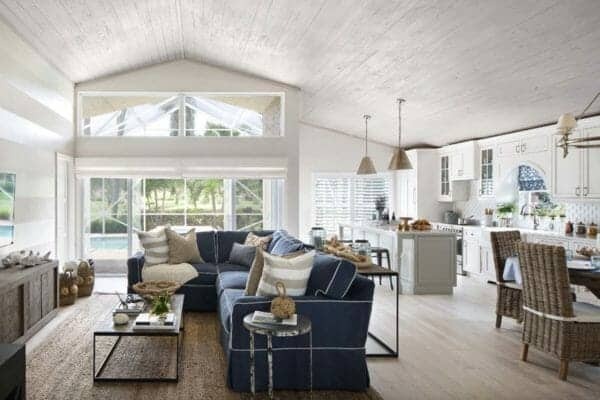 Every space seems to be thoughtfully considered, creating warm and welcoming interiors that will stand the test of time… Readers, please share your thoughts, would this be your idea of a dream home? 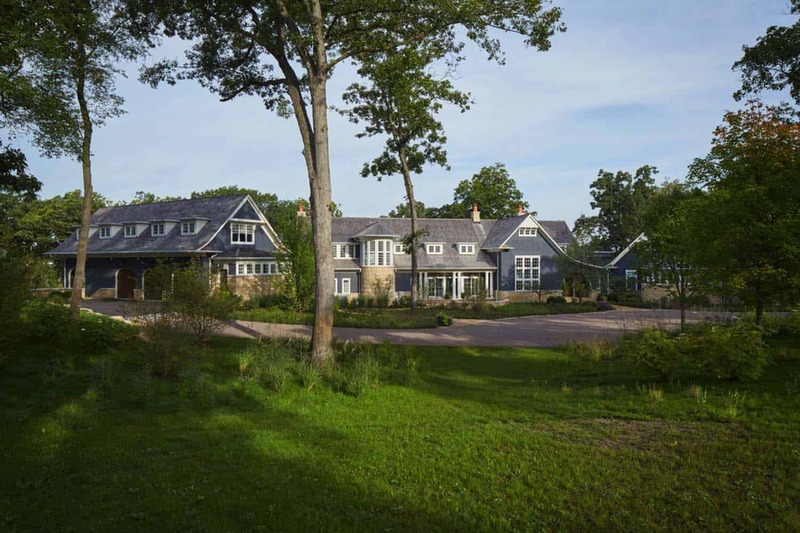 Note: Have a look at another amazing home tour that we have featured here on One Kindesign from the portfolio of Morgante Wilson Architects: Sophisticated Yet Casual Lake House Retreat in Wisconsin. Above: This breezeway provides access to both the garage and an in-law suite which was constructed above the garage. The breezeway also offers access to the front yard and backyard swimming pool and cabana. The exterior shingles were also used as the material for the interior walls. 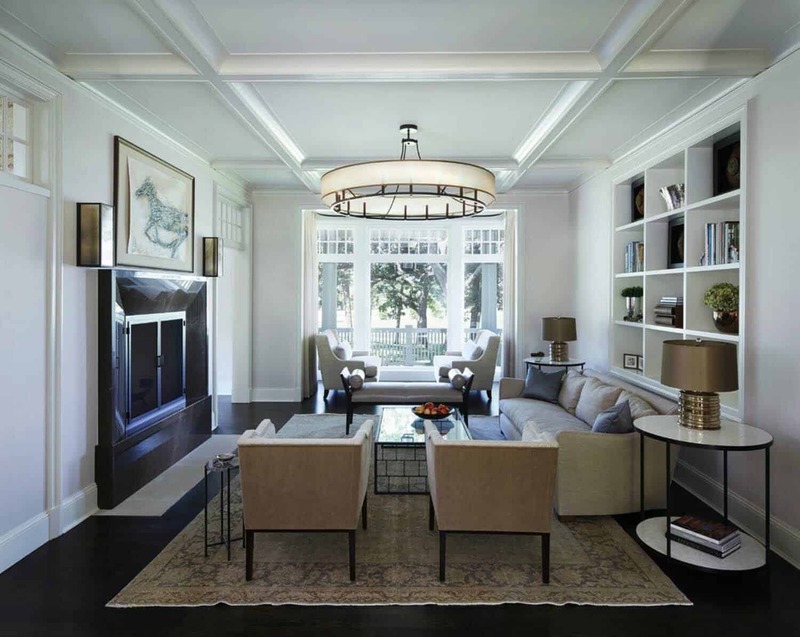 Above: A dramatic rectangular chandelier was custom designed for the home’s dining room by 2nd Ave. The live-edge dining table was fabricated with a re-purposed piece of wood from one of the surrounding trees, prior to construction. The side chairs are from Kravet and upholstered in a brown/cream fabric from Clarence House. The armchairs are custom fabricated by Park West Furniture Inc. and upholstered with a brown velvet fabric from Carnegie. Above: The living room walls are upholstered with a creamy silk wallpaper sourced from Phillip Jefferies. The sofa is from Montauk, upholstered in a soft cream and grey fabric from Romo. Two salon chairs anchors the space, upholstered in a mix of fabrics. The outside fabric is a faux-suede from Architex, while the inside is upholstered in a textured fabric from Holly Hunt. 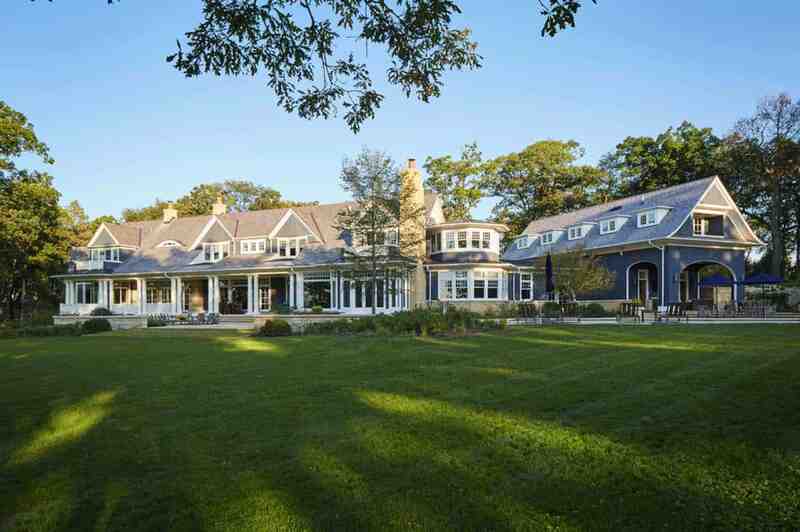 Above: The family room is at the heart of the home, flanked between two expansive window walls with access to the house. Grounding the space is a natural, braided-sisal rug from Merida, which complements and enhances the openness and natural lightness of the space. The area rug also enhances the sand-color stone surrounding the family and dining room fireplace. 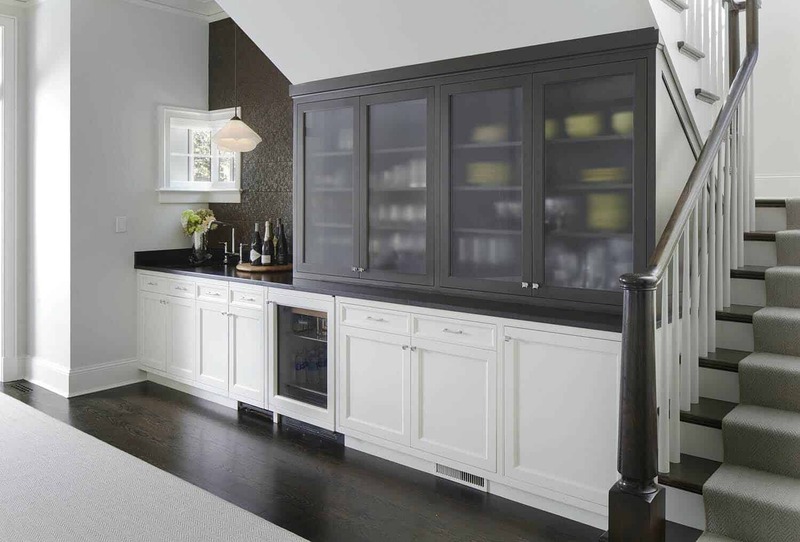 Above: Highlights of the kitchen includes a walnut butcher-block island countertop, with perimeter countertops in a brushed, black absolute granite. Suspended above the island are pendants from Visual Comfort. The x-back counter stools are from Pearson, upholstered in a brown/tan basket-weave fabric from Schumacher. 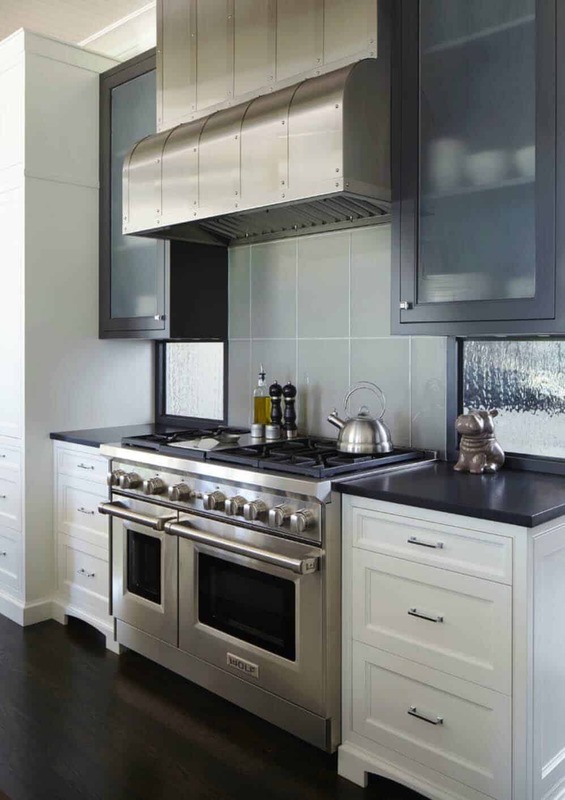 Above: The glacier glass tile backsplash is from Stone Source. 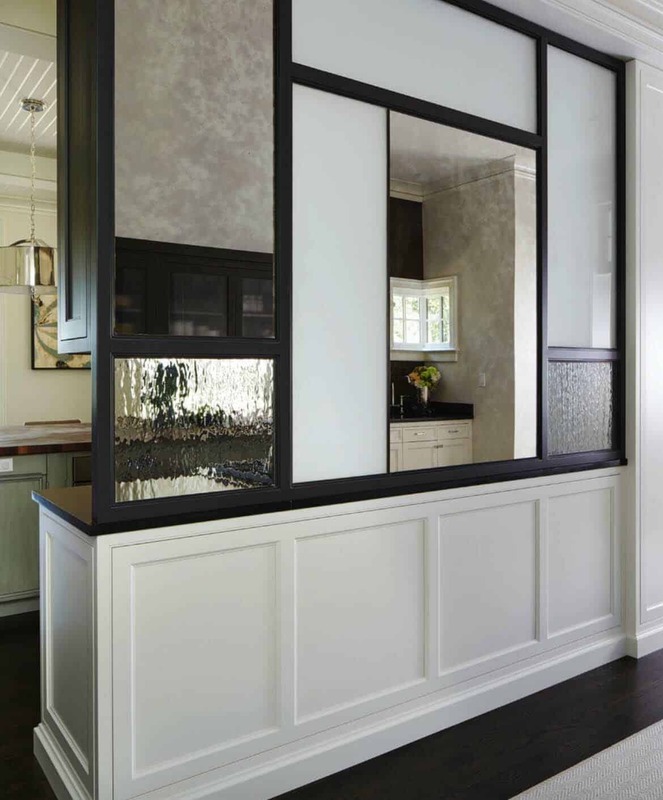 The upper cabinets are composed of a Gun Metal material designed with a frosted glass insert. Above: In the butler’s pantry, a textured metallic tile is from Ann Sacks. The upper cabinets are the same Gun Metal material that was used in the kitchen. 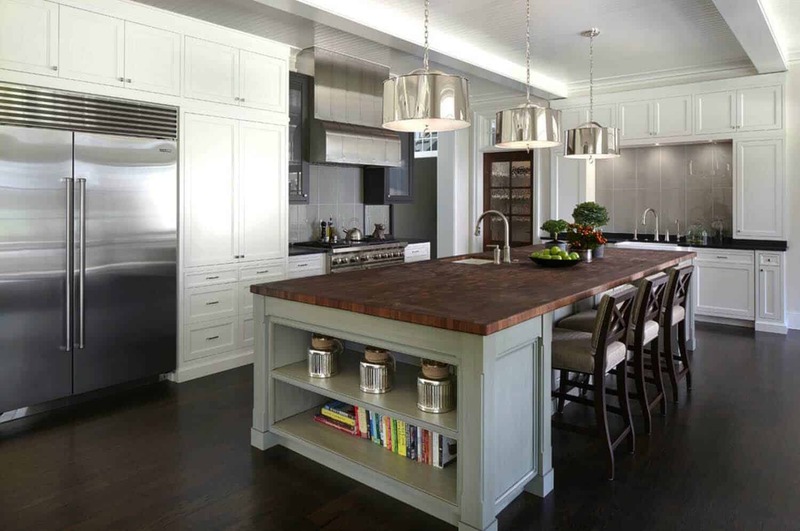 A pendant light above the sink is from Hubbardton Forge. 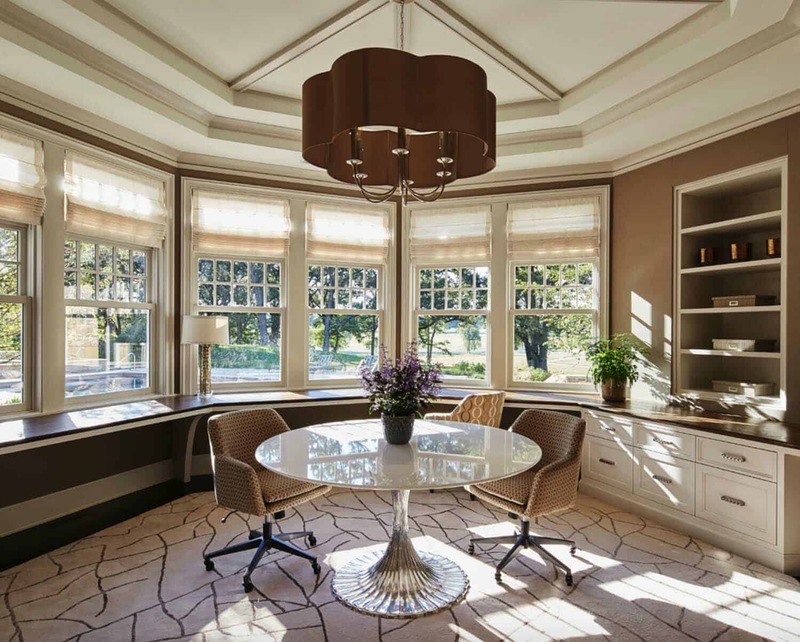 Above: The breakfast room is located just off the kitchen, illuminated by a large picture window. Furnishings includes a Bradley and McGuire concrete table with Baker dining chairs upholstered with a soft but durable brown velvet from TDC. 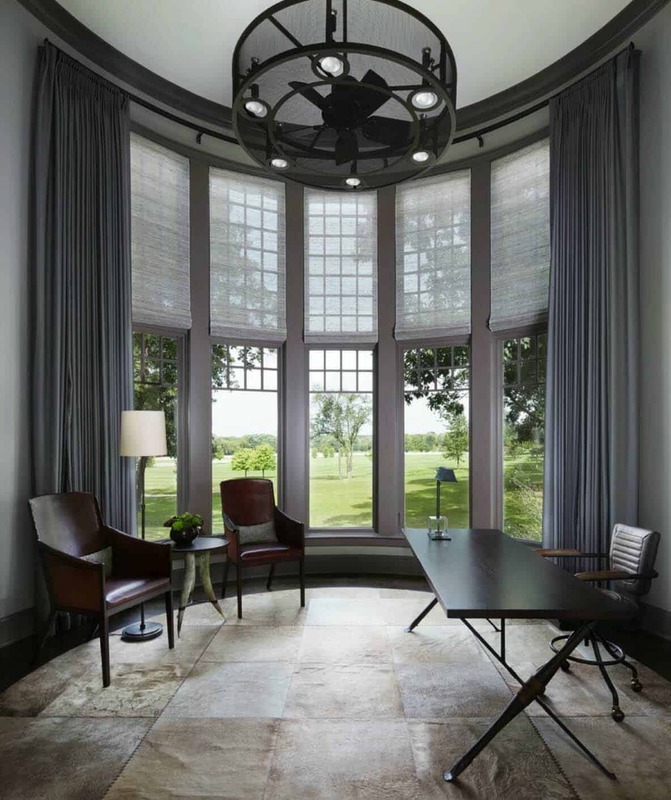 Above: This circular office with double-height windows illuminates the space with natural light. An exquisite custom-designed, hair-hide rug is from Yerra. The leather side chairs are from Baker. The unique X-shape desk is a custom-designed piece built by Rustic Elements. The use of re-purposed wood was an important design factor, sourced from surrounding trees removed during construction. The mesh chandelier was custom designed to complement the geometry of the room, fabricated by 2nd ave. Above: The octagonal office’s desk top was fabricated with reclaimed wood, from the land the home sits upon. Green wallpaper from Pollack, doubles as a cork board near the built-in shelving unit. The center table was purchased from Oly and the office chairs were upholstered with fabric from Pollack and Calvin. 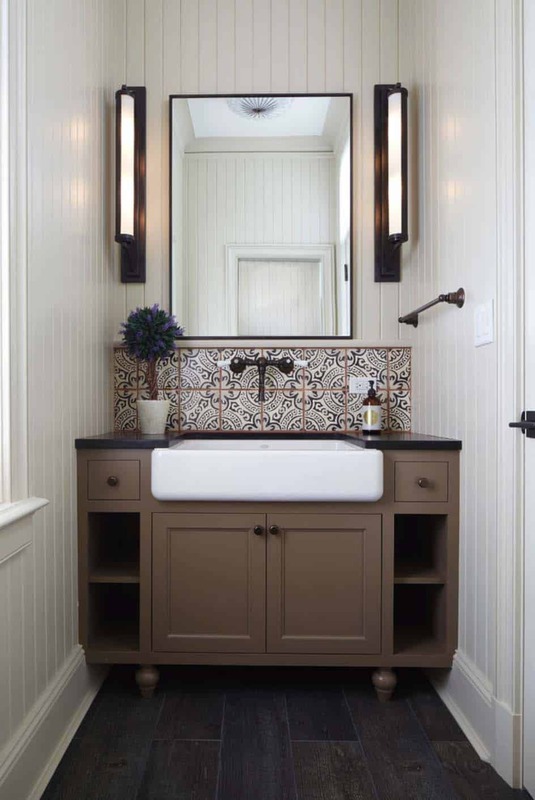 Above: The powder bathroom features wall sconces from Visual Comfort and a ceiling fixture from Tower Lighting. The backsplash tile is painted terra-cotta from Artistic Tile. The vanity countertop is brushed black absolute granite, while the sink faucet is a wall-mount Bridge Tap in Tuscan Brass from Rohl. 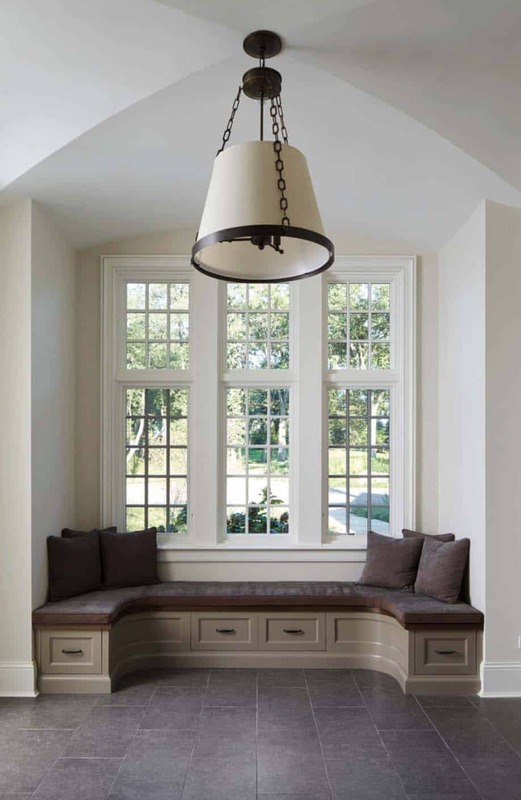 Above: A built-in bench provides convenient mudroom seating. The bench has seat cushions upholstered in a grey chevron fabric from Opuzen. Above: The master bedroom features soaring ceilings and corner windows to maximize natural light in the space. 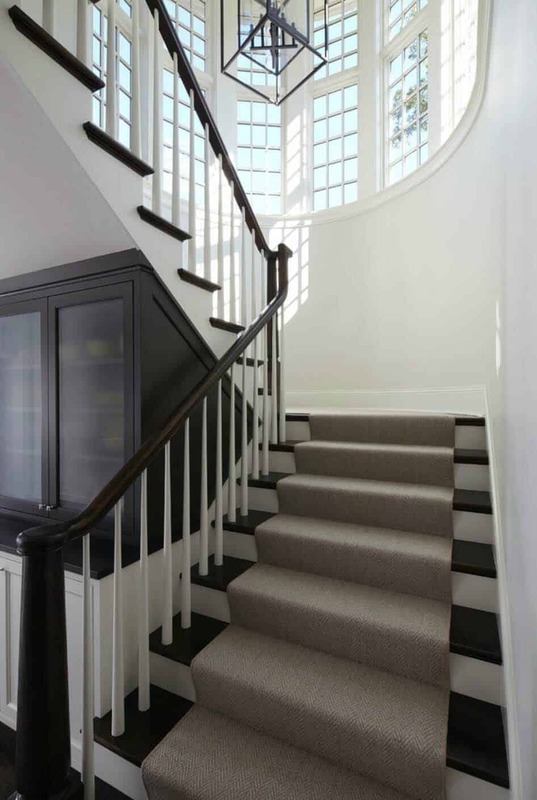 The warm-brown, chevron-patterned rug is from Kravet. Lee Industries lounge chairs are upholstered in cream velvet from Opuzen & Keleen Leathers cream leather piping. The square side table has a faux-shagreen-wrapped top which appears to be floating above a black metal base from Made Goods. 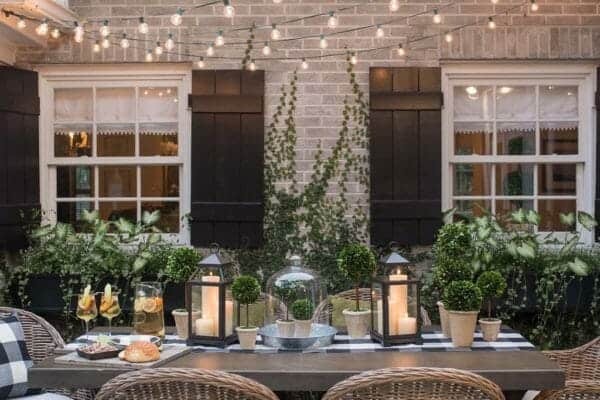 The small table is from Rustic Elements, while the side chairs are sourced from Oly. 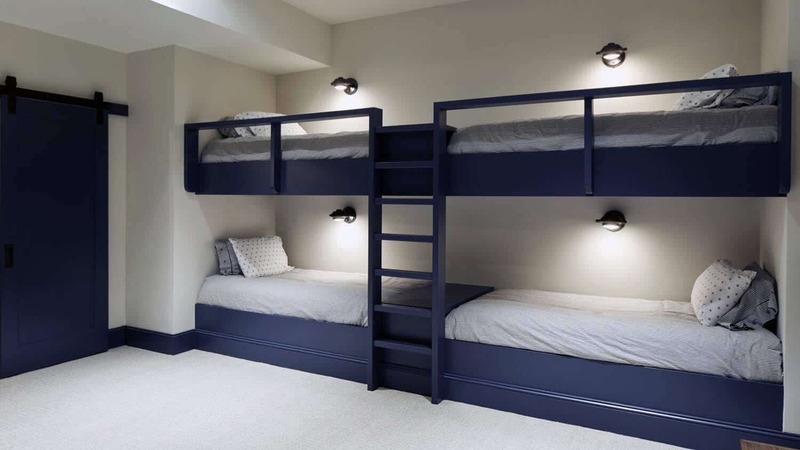 Above: An 8-person bunk room with built-in bunks are painted in Hale Navy HC-154 | Benjamin Moore. 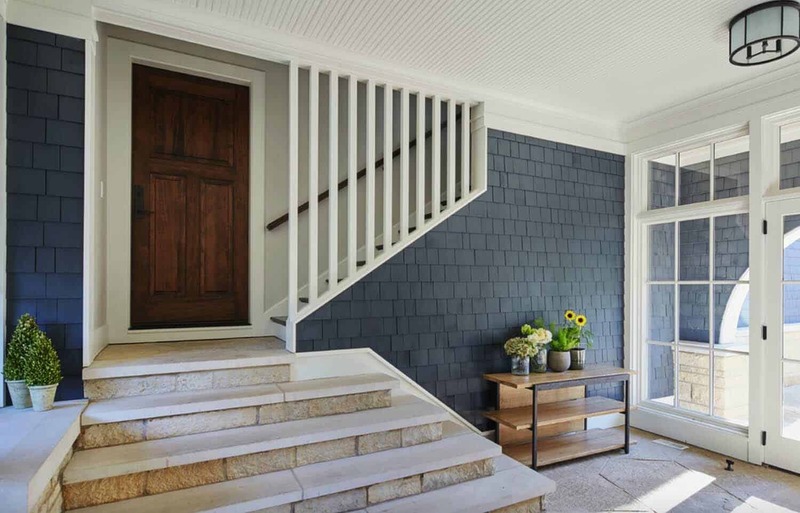 A rustic barn door on sliding barn-door tracks is also painted in Hale Navy, which allows for privacy. 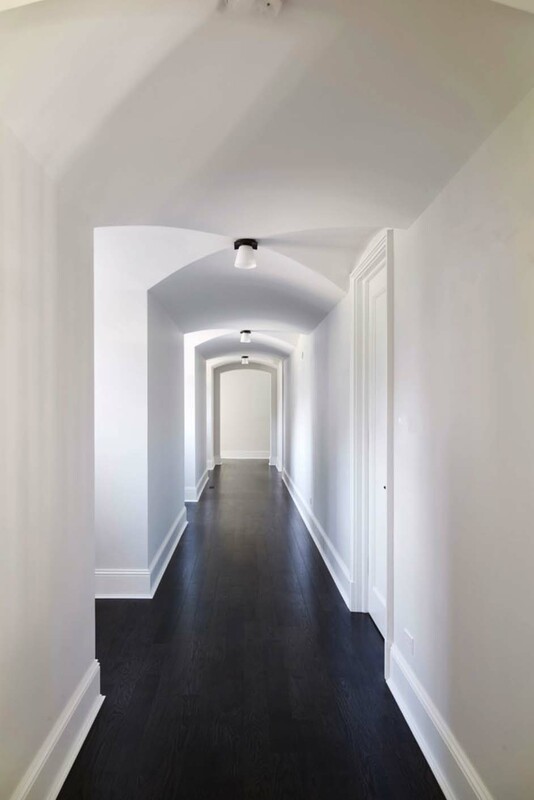 Light is provided with individual wall sconces, sourced from Robert Abbey. This space is perfect for sleepovers! Above: In the powder bathroom, the wall sconces were sourced from Visual Comfort. The backsplash is a beautiful mix of Pyrite Gold Polished and Antiqued tiles. 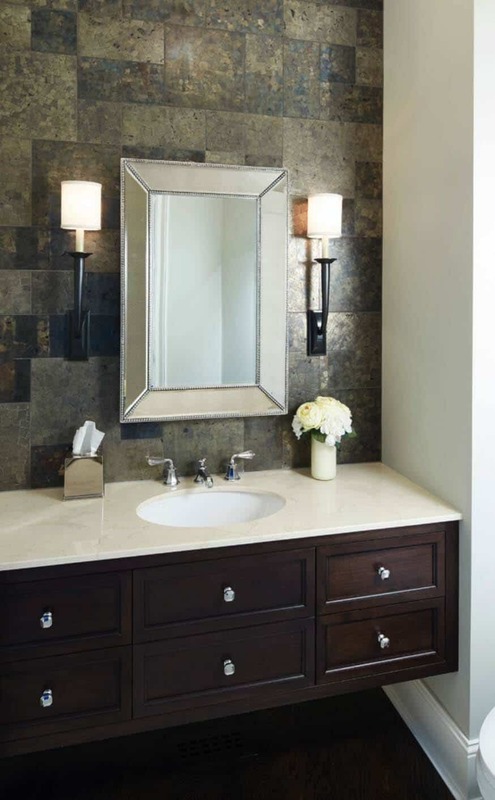 The vanity countertop features a polished crema marfil marble, while the faucet is polished chrome and crystal Art Deco Widespread Low Spout from THG: Paris.